PRESCHOOL AND KINDERGARTEN age students learn differently than primary school students. While incorporating and adapting valuable theories of childhood language learning, we design kindergarten classes with the needs of the young learner in mind. At this age, pronunciation of English can be easier for students. As they are still learning to mold their mouths to their own language, their mimicry skills are excellent. We offer simple, easily mastered vocabulary and patterns—with patience, understanding, and encouragement—to foster the development of their overall language skills. Young learners have shorter attention spans, so our classes are designed to challenge and fascinate them for a 30 minute class period that makes learning English fun. Our focus is on activity and interaction, using puppets, picture cards, objects and gestures in meaningful ways. Drills are conducted as games; puppets become lively, non-threatening friends, and every short unit includes songs. When used to present new language or illustrate an activity or game, this approach keeps students alert and attentive because they are having fun. 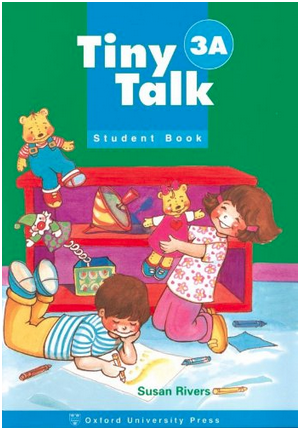 This three-level listening and speaking series in American English provides a simple but steady development of language through characters, themes, and situations relevant and appealing to very young students. The three levels are divided into A and B sections. Each section includes a combined Student Book and Workbook cassette, picture cards, and wall charts.